I finally got some time to get at least a little bit out of town over the Thanksgiving break and decided to scope out some bouldering I had seen images of at various sites including B3 Bouldering. This was the spot variously described as Elkland, Nicky's Boulders or The Billiards. (Although I usually go with past precedent, Elkland seems a better name so I will use it for this post.) There has been a lot of recent activity in the area resulting in some impressive projects going down and unlike the alpine areas, they are accessible over the winter. So I thought I would look around. After a bit of a thrash wandering around looking at dozens of huge round and mostly blank orange globes, I found the boulder with Carefully by Hand on it. 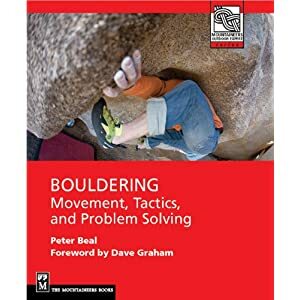 I was looking for a problem called The Real Deal Peter Beal, a crimpy face that was originally rated V9 but apparently had broken. I found it northeast uphill about 100 yards above Carefully by Hand. I looked over the holds and it was pretty obvious that a mid-height crimp was gone. However the wall was covered in small holds and after a little bit of searching I discovered a small pocket on the left that allowed progress by trending just left on the same holds. With some brushing the problem was set to go and I did it in a few tries. I like the idea of calling it the New Deal. The problem is very reminiscent of crimpy problems at Flagstaff Mountain with orange grainy rocky of middling quality. I think the grade might be soft V8, maybe less but a fun problem and worth doing if you like that style of climbing. I looked over Dreamclimb V8 or V10 SDS which is just east. A rising traverse across a steep boulder, it looks quite good. The big kids version of the problem is Pocket Frogs, uphill about 50 yards from Carefully by Hand, and rated V13. After doing the New Deal and looking around, I texted Chad Greedy and got the directions to Memory is Parallax which is in a different sector, just to the west. This problem is very impressive and beautiful with an easy layback intro to four very hard moves to topout. Definitely worth checking out if you are climbing in the V13/14 range. In a sightseeing mood, I continued into the park proper and scoped out Mirror Reality, another instant classic. For the grade, this problem looks like one of the easier ones on the Front Range, on immaculate stone and 2 minutes from the road. A couple of days later I went back up to Elkland to work a little more on Carefully by Hand. This problem involves a tricky move off a small crimpy hold to a good break, then a very difficult sequence left along a sloping seam to a crux slap to an edge. While I was able to do the other moves quickly, I found it very difficult to get across the last gap. While sharp, the rock is very good and the features make for an obvious line on an otherwise relatively smooth and featureless boulder. Since this area is very feasible in winter, I see this problem as a good project in coming months. I would recommend it to anyone looking for a crimpy technical problem at the grade. While Elkland may not be to everyone's taste, my visits reminded me that the Front Range is stacked with possibilities in all grades from V0 to V15. Get out there! And if you have descriptions and ratings for other problems, email me or put them in the comments.